According to a fan who attended the second night, compared to the first night it was far from sold out. Another fan recalls how before Spread Your Wings, Freddie said that he "wanted all the boozers and piss heads Brighton is famous for to use their lungs and sing this." On the second night in Bristol the band played Liar and even Brighton Rock, which had been dropped from the setlist on this tour. The same fan quoted above says Freddie pointed out how it wasn't in the set anymore, but "you fuckers wouldn't let us out of here if we didn't play this." It's the last documented performance of the full song. The ending of Brighton Rock would be heard after Brian's guitar solo through London '80, and again during the Works tour in 1984-85. 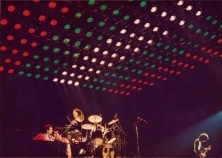 Through 1981, Keep Yourself Alive would merge into Roger's tympani solo, and it would be resurrected for The Works tour as part of a medley of songs from the first three albums. The picture could be from either night, but it reveals Brian in a different outfit from the picture seen on the first night's page.